DQS8finished, originally uploaded by myittybittyquilts. I'm sharing with you a little doll quilt that I completed this year, using all fabrics from my scrap bucket. I had made a large lap sized Merry Go Round Quilt last fall and I wanted to challenge myself to a mini version. It was really a lot of fun to put together. I just loved matching up all of the fabrics! I was able to practice a new-to-me quilting technique because it was such a small size. 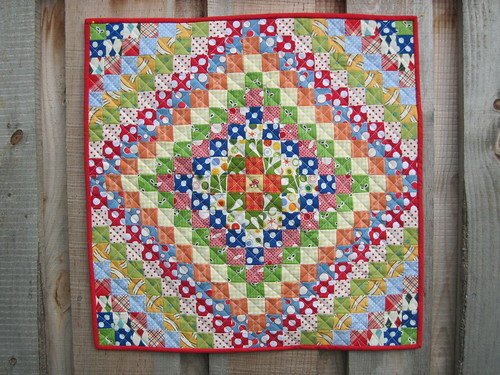 Hope you enjoy and have a jaw-droppingly good time looking at all the gorgeous quilts! 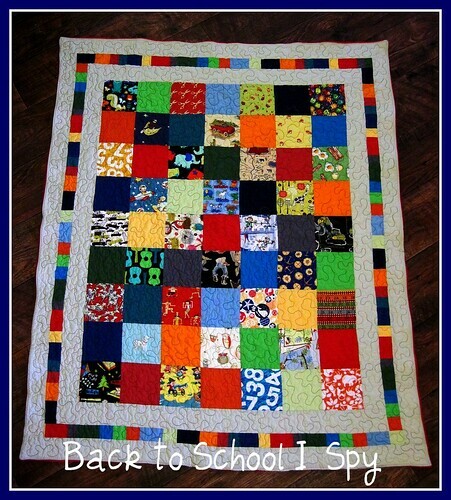 Back to School I Spy, originally uploaded by myittybittyquilts. My youngest went off to Kindergarten this year. I'm caught somewhere between *sniff* and Yay! Well, anyway, each child needed a nap mat. The teacher sent home a note saying that they could simply bring a towel for a mat, but there was no way the son of a quilter was taking a towel for a mat :) I saw this great I Spy pattern written up by Kathy Mack of Pink Chalk Fabrics for Craft Hope. I knew that I wanted to make one, but I made a few changes (as usual!) Check out the great FREE pattern! SMSummerDQS, originally uploaded by myittybittyquilts. 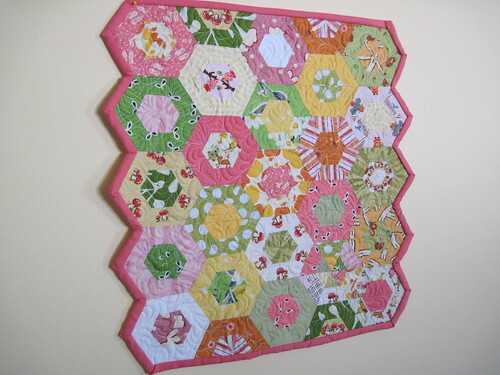 Here is the little quilt I did for my partner on the www.sewingmamas.com doll quilt swap. I saw a mini Trip Around the World in an old (at least 20 years!) quilt magazine and sketched out a version in my handy dandy graph paper notebook, adding it to my to-do someday list. Just a few weeks ago, I saw that the super talented Red Pepper Quilts had done one of these in stunning primary colors. LOVE! Well, that quickly moved this project up from the TO-DO to the MUST-DO :) I was pretty sure that I didn't want to just cut and piece all those little pieces so I used a very thin fusible web and ironed on all the squares (cut 1 1/2" each), then sewed the vertical seams first and then horizontal. I used some of my favorite bright summery fabrics all framing that one little Heather Ross mushroom. I quilted this little one in an all over diagonal pattern and bound with a solid red. 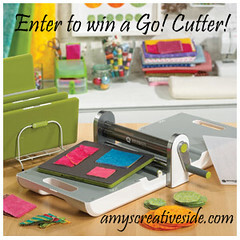 Amy, from Amy's Creative Side Blog is having a ton of fantastic giveaways. Definitely check her out. I would love to win this! 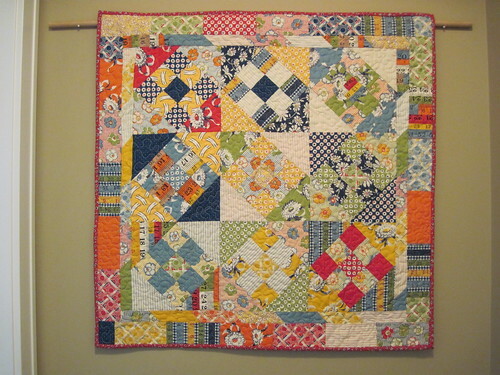 Recess Mini Quilt, originally uploaded by myittybittyquilts. Happy Memorial Day! And a huge thanks to all those who have faithfully served our country in the armed forces. Most of you are volunteers, some of you were drafted, but you all gave of your time and energy to make our country a GREAT place to live! Above is my most recent finished project. I have a spot at the end of my hallway that has displayed seasonal quilts. The problem is, I only have a fall and winter one that fits. The empty space was bothering me so I picked up this Shnibbles pattern (LIttle Bit O' Country, I believe) and found some leftover Recess charm squares and went to work! It was a quick, fun project to do and I couldn't be happier with the brightness it adds to the hall! Now, we are settled though, and I had no more excuses. Our bedroom walls are a sagey green with white trim. Dh really likes more traditional fabrics and patterns so we decided together on the fabric line Glace by Moda. It's really a Christmas line, but really it had so few obviously Christmas prints that I knew it would be just fine. Pattern is a disappearing 9 patch. Quick and easy! The best part about this quilt, though, is that I had an opportunity to visit my sister over Spring Break and quilt this on her mid-arm. So fun! I made tons of mistakes, but it was so much easier than straining my muscles trying to quilt this on my home machine! Have fun visiting all the quilts and blogs!